Feel good, look sleek and are very forgiving. That is all. Just ordered the 6i and a 58 degree M Series wedge. Grafalloy Pro Launch Blue Axis graphites from DTG along with DTG Midsize Velvets. sdandrea1 good iron....they flew a tad too high for my liking, I had the standard finish....but they are about as easy to hit forged iron as there is....and super clean and good looking! OMG!!! You just got a brand new set of Pings, if memory serves me correctly! Another attack of "ho fever?" Welcome to the club. I have had my DBM'S for about 4 years now. Some slight wear on the finish but not much at all considering I am playing most of my rounds off the harsh AZ ground. Have you hit the Maltby PTM to compare them ? Eguller Have you hit the Maltby PTM to compare them ? Nice. Look almost like some old Titleist DCI irons except for the color - which I like. agreed, excellent irons in terms of looks and play-ability. My go to set to build for folks. Maltby has always made great irons IMO. They aren't usually very pretty, but they perform as well as anything else. I had a set of the original versions of those (M-05 I think?) and they were great. Contrary to some posts in other forums, these are bendable (mine are 2 degrees up) and they do not feel harsh. The sound/feel is def forged. Could be the graphite shafts. feeling, kinds depends on shafts and center strikes. Graphite & center strikes = smooooth. Yep. 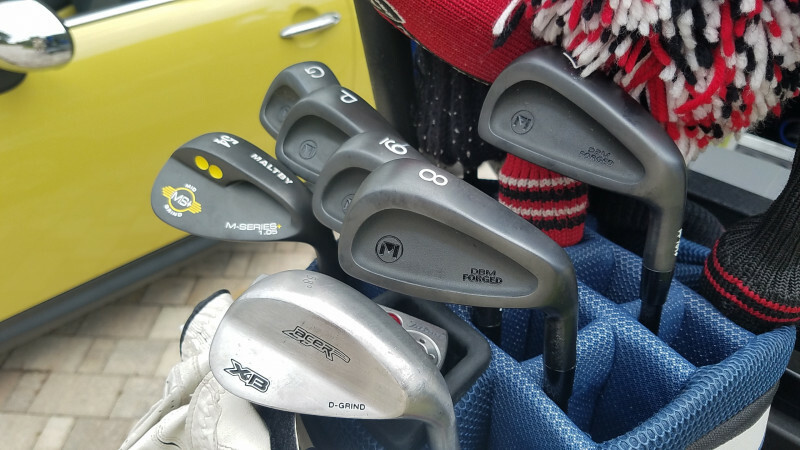 They did not want to bend the M Series wedges for me. They did a great job - no hosel marks from the bend. I guess there's a chance they hand selected and found some that were 2 degrees out of spec on the upright side. I'm the "some posts in other forums" that Steve refers to. I had PTMs on Recoils, and DBMs on Kinetixx. While the PTMs felt nice, I was pretty wild with the Recoils. I think those were too light (mid 70 grams). 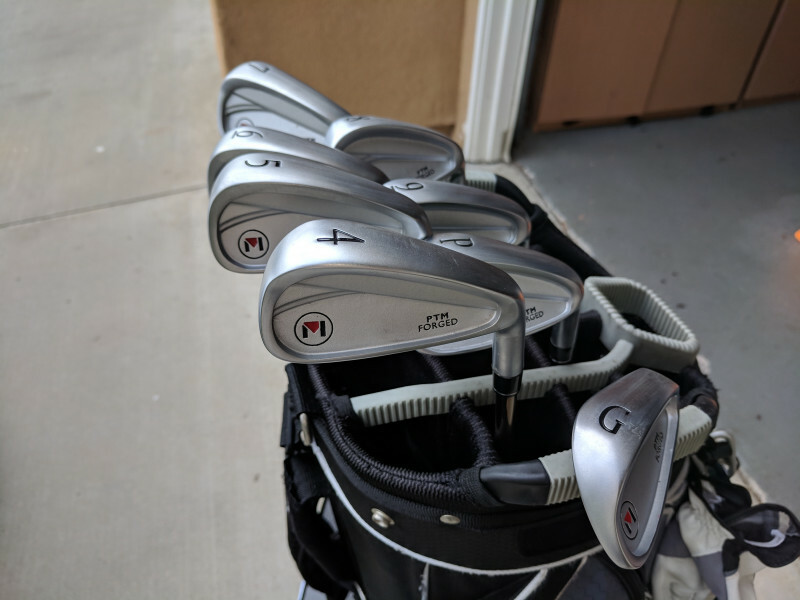 The PTMs seemed really big to me, but most of my recent irons have been smallish. I hated the feel of the DBM/Kintexx set. Really harsh. Really really harsh. I have Maltby M+ wedges, so I am used to the feel of that finish. And having had several M-5/TE sets over the years, I know that head as well. But this DBM/Kinetixx really did nothing for me at all. Maybe the Kinetixx have a Steelfiber feel to them, I did not like the Steelfiber feel. 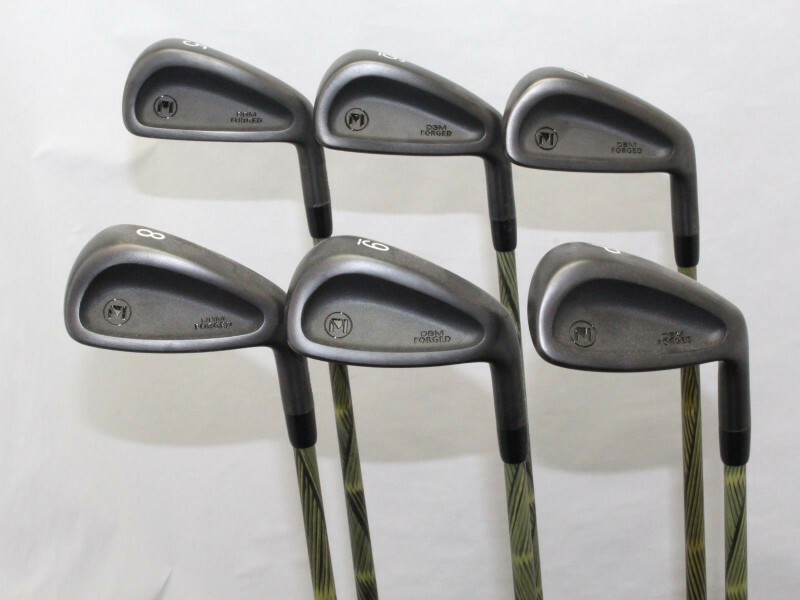 On a whim, I picked up one of the Honma 737V sets that are flooding heebay these days. 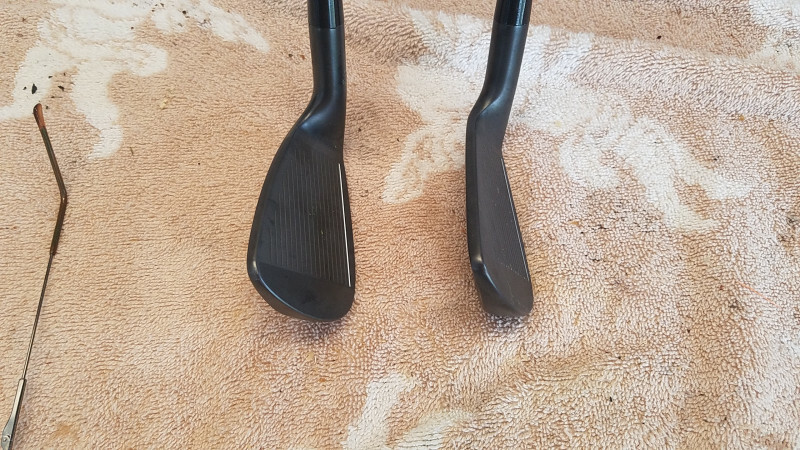 These have Nippon Modus 120 S shafts. These irons have a super soft feel. To make it worse, I played a Wilson Duo Spin ball. Man, talk about a soft feel....that was too much. I've had a couple of rounds in with the Honma's and they are the 1st set that I think are going to unseat the Dynacraft Prophet MuscleBacks. Any interest in selling the heads only on the PTM? Sparky I played a Wilson Duo Spin ball. Man, talk about a soft feel....that was too much. Sparky - I did not realize that was you! Now that I look I see it was Sparky14.....duh. You are not the only member claiming harsh feel on the DBM, BTW. Feel is so subjective and affected by sound too. I'm coming off of PING G400 irons that are "clicky" faced clubs. Combine that with soft tip graphite, senior flex shafts AND my Wilson Duo balls, the DBMs feel smooth and soft. RE: size. One of the things that attracted me to the G400 iron was the more compact design and thinner topline than the older G series (G10/15/20). My G400 irons look HUGE now, but when I hold them side-by-side with a DBM, the blade is about the same length - less offset and thinner topline tho. Sparky These irons have a super soft feel. Not according to this review in Golf magazine https://www.golf.com/equipment/2017/03/06/honma-tw737-v-irons-review-clubtest-2017, "impact feels a bit harder than many testers prefer in a forged blade"
colej Sorry, sold the whole set a month ago. Feels like a GP Velvet Tour. I use these and Karma Velvets. The midsize feels like a midsize. sdandrea1 ok, now I need the comparison to the Karma , as that's another cost friendly grip I've used! Seems to me the cheaper grips wear and/or get slick more question ckly then say a crossline. Especially if they aren't cared for properly! Day late and a dollar short! Those look Sweet ! Love the classic look of them. I have used the Karma's more. This is my first set of DTG Velvets. The taper on the DTG midsize seems less uniform than the Karma, which has a more constant taper. The DTG tapers off steeper near the small end. I have a buddy here in FL that uses the Karma velvet exclusively and he says they wear well. I don't really care about longevity since they are $1.39 and easy to change. sdandrea1 I don't really care about longevity since they are $1.39 and easy to change. Plus you'll probably sell them in a couple of weeks anyways.